and a hot blazing sun filled the sky. 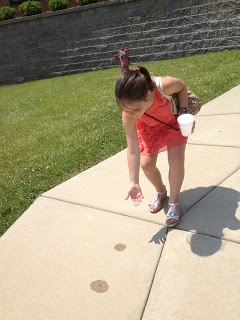 She was bent over intently looking at two tiny water spots on the sidewalk. It wasn’t raining. Curious, I watched and waited. She skipped a little and putting her hand inside a foam cup, pulled out something and dropped it. Then the watching and intense study began once more. Her smile radiated almost as brightly as the sun that day. My little friend was dropping ice cubes! We began to chat and I presented her with a few challenges. We dropped a piece and then counted. It was gone in 63 seconds! That was cool! We dropped different sizes and guessed how long it would take each piece to melt. How much longer did it take the big pieces to melt compared to the smaller pieces? We were amazed at how fast the sidewalk became totally dry once more. It wasn’t a long interlude, but it was fun! Not only did we learn a little bit about melting and evaporation, our friendship grew a little that day also. I made a connection with my young friend that I’m sure she will remember next time she sees me creating a bridge for future communication. Why not get a cup of ice and head to the nearest piece of cement (driveway or sidewalk)? You could even do this on the boards of a deck. Make sure you take enough to eat a little too! Then have fun experimenting and cooling off! Silver Dollar City General Store in Branson, MO .